The Oakland Press Blogs: Open Book: A Sports Blog: Devin Gardner's is Michigan's undisputed leader, but is Shane Morris the better QB? 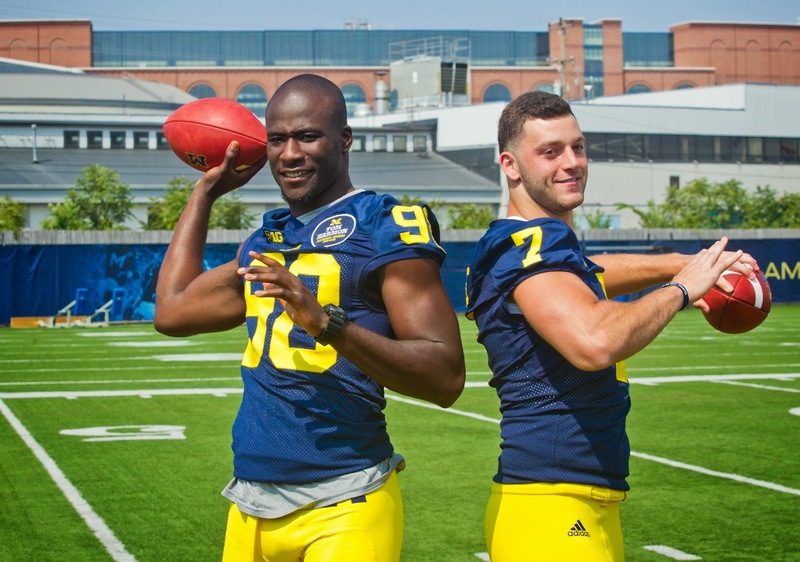 Devin Gardner's is Michigan's undisputed leader, but is Shane Morris the better QB? Devin Gardner is the undisputed leader of the Michigan football team. He is a fifth-year senior. He is the returning starter at quarterback. He is a tough player with top-end competitive character. But is he really, Michigan's best quarterback? While there are times when Gardner has been electrifying, especially with open field runs, his consistency throwing out of the pocket has been spotty, both in terms of accuracy and turnovers. Sophomore Shane Morris appears to be the better pure passer. While he doesn't have the same degree of ability as a runner, Morris seems to have a better feel in the pocket than Gardner and isn't lacking mobility. One of the biggest issues for Michigan coach Brady Hoke, if Gardner flashes more inconsistencies, is if and when to turn to Morris. Last year, such a QB change literally elevated Michigan State's program last year.